Mining Projects Group (ASX:MPJ) has intersected further fertile nickel geochemistry in recently completed diamond drilling at its Roe 1 Prospect in Western Australia. The first cross section of diamond drilling intersected elevated nickel-copper-PGE mineralisation within the core and at the base of a 170m ultramafic flow. This work confirmed the presence of a new nickel bearing lava channel to the north of the already identified 40km strike zone, within a broader ultra-mafic system. Following results at Roe 1, MPJ announced a $2.2M capital raising to fund its 2015 work programme, and plan to further define the 40km strike and drill priority targets. This raise comprises $600,000 from the issue of 100 million new fully paid shares at $0.006 per share with a one for one free attaching option. A 1 for 5 non-renounceable rights issue to raise approximately $1.6M will also be offered to eligible shareholders at $0.006 per share with a one for one free attaching option. The geology at MPJ’s Roe 1 Prospect is comparable to the Cosmos Nickel Project where the core of the system contained disseminated sulphides above rich massive sulphides. 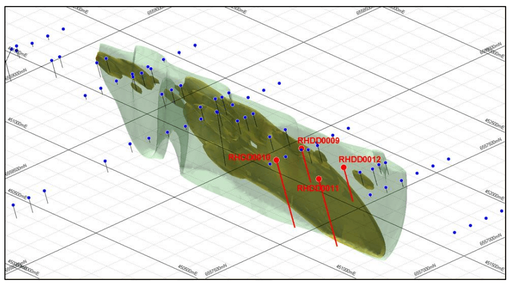 This is encouraging as the rocks at Roe 1 appear to be the upstream portion of an extensive fertile system and highlights the potential for downstream nickel sulphide deposits. The confirmation of fertile lava channels at both ends of the 40 km strike at Roe Hills increases the scope of the entire system while reinforcing MPJ’s geological “Cabbage Leaf” model of Kambalda style komatiite flows. The diamond drill holes completed were designed to establish geological stratigraphic control so as to bring Roe 1 in line with exploration progress at the Talc Lake Prospect. “MPJ’s leading Technical Team continues to achieve positive results by maintaining its scientific and methodical approach to the exploration using the knowledge and expertise accumulated from previous modern nickel discoveries made by the team. The confirmation of a new major lava channel at Roe 1 is a very exciting progression which significantly increases the prospectivity of the entire 40km strike at Roe Hills. It’s a major credit to Mr Hutchison and our technical team as they continue to pinpoint successful drill holes, rapidly defining strategic target channels highly prospective for major discoveries. The nickel intersections and the geology recorded in the holes to date at Roe 1 have a very strong correlation to the discovery history of known deposits such as Cosmos, Prospero, Sinclair, Cerberus, Silver Swan and Camelwood Nickel deposits. These deposits were all discovered over a period of time by following the disseminated and narrow nickel sulphide leads within the core of the lava channel.